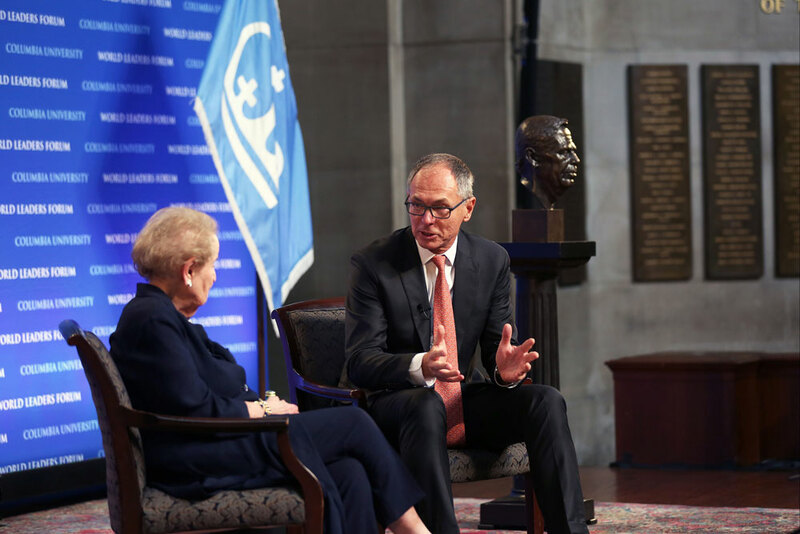 The former U.S. secretary of state spoke at a ceremony honoring the late Czech president. 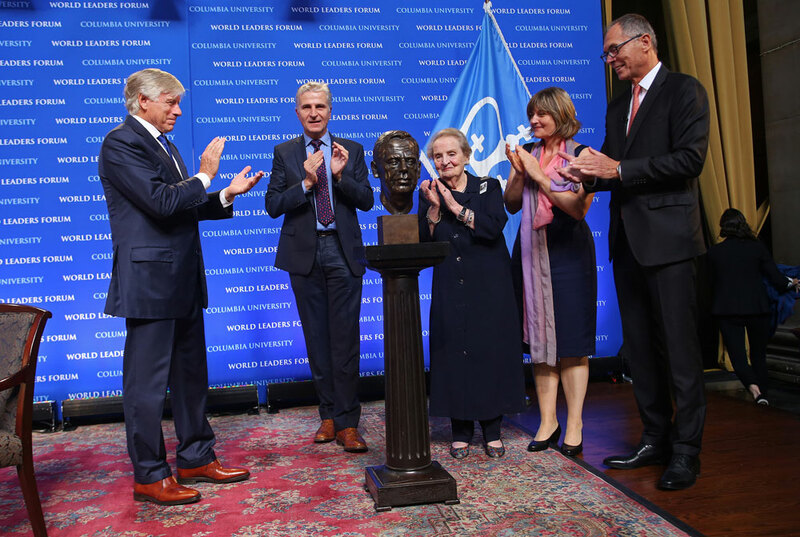 Madeleine Albright, the former U.S. secretary of state, discussed Václav Havel’s life and how his legacy continues to play an important role in global politics. 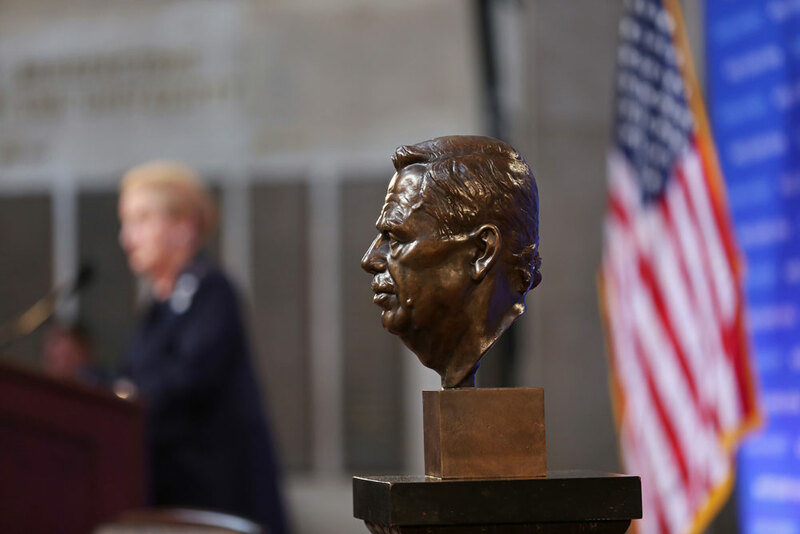 Under the gaze of the statuary in the Low Library rotunda, former U.S. Secretary of State Madeleine Albright stepped to the podium to honor Václav Havel, the Czech playwright and dissident who in 1989 became the first president of newly independent Czechoslovakia and, later, the Czech Republic. Looking on from the side was a bust of Havel — a gift to Columbia from the Václav Havel Library Foundation. 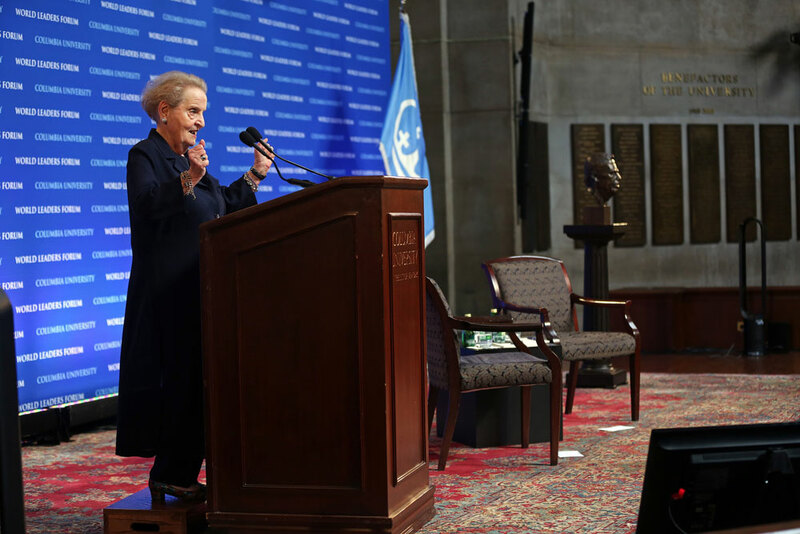 Speaking before a full house on September 27, Albright discussed Havel’s life and how his legacy continues to play an important role in global politics. 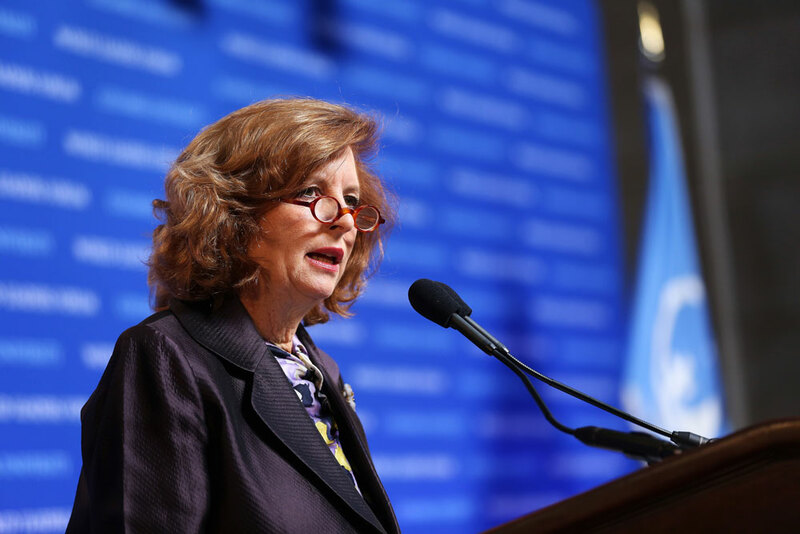 She spoke in conversation with Jan Svejnar, who served as an economic adviser to Havel and now directs SIPA’s Center on Global Economic Governance. Dean Merit E. Janow and University President Lee C. Bollinger were also present for the festivities. Albright, a Columbia PhD and Russian Institute alumna who wrote her dissertation on failed political reform in 1960s Czechoslovakia, was herself born in Prague, the daughter of a Czech diplomat who brought his family to the United States in the late 1940s. She recalled how she met Havel a year after he became president: Havel had spent the three decades prior as a voice in the Czech struggle against communism. In 1968, after the suppression of the Prague Spring (and, coincidentally, immediately following Havel’s first trip to New York, where the Public Theater had produced his play Memorandum), Havel was banned from theater for his political activities. As a result of his political activities he spent time in and out of prison, including a stint from 1979 to 1983, and was subjected to near constant surveillance and questioning by the secret police. But Havel never stopped writing and speaking about democracy. By 1989, that dissident had successfully led the Velvet Revolution, a peaceful toppling of the Czech communist government, and became the president of a democratic Czechoslovakia. Albright met Havel in 1990 during a trip to Prague with the National Democratic Institute. A few months later, she was with Havel when he addressed the U.S. Congress for the first time. Most in the audience expected it to be a celebration of the end of the Cold War and the final victory of democracy over communism. However, that’s not what Havel had in mind. 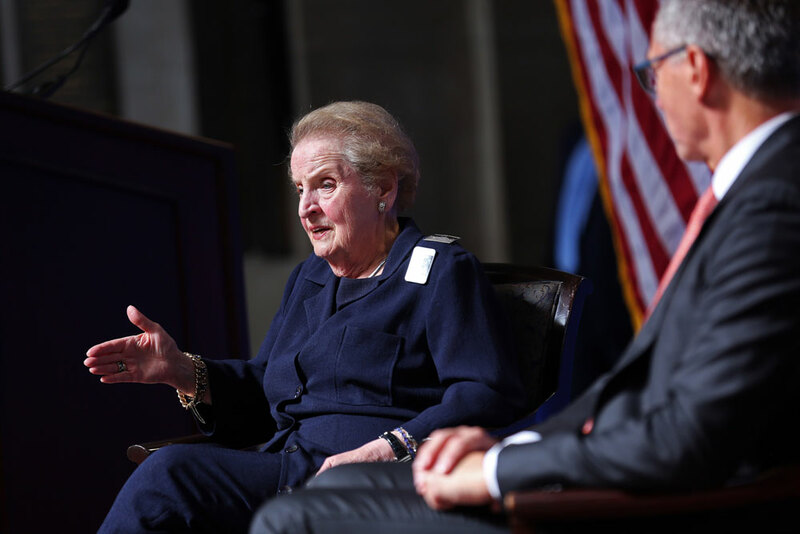 “Instead of ideology or politics, he stressed the obligation we all have to each other,” said Albright of that speech. In 2006, three years after the end of his presidency, Havel took up a two-month residency at Columbia. Until his death in 2011, Havel worked tirelessly for a “Europe without walls, fully at peace and wholly free,” Albright said. In one of his last public statements, he signed the Budapest Appeal, warning the EU about the encroaching threats to European liberal democracy and asking “Europe’s governments and parties to build clear standards of compliance with the values of democracy." What would Havel think about the current state of affairs? Albright thinks he would be disturbed by the forces he saw taking root in Europe in 2011 digging deeper. He’d be troubled by the refuges crisis, fractures in European unity, the growing influence of authoritarian regimes, like that of Vladimir Putin’s Russia and the undermining of democratic institutions across the world. “Democracy is facing new and vigorous round of tests,” she said.